We used to see all the geraniums in the windowboxes in Germany. Great plant! Love your Merlot colored one. We have something in common about Geraniums. It's a favorite plant of my mother's that I always disliked when I was a child and one of the reasons were because I thought they smelled strange. As and adult I found them to be just too common, perhaps because it was a plant that I saw a lot as a kid. 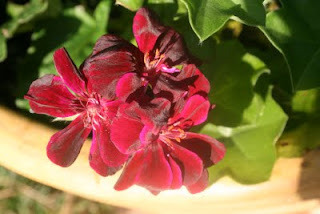 Two summers ago I bought a pink Ivy geranium, it was the cutest little geranium I had every seen. This sparked my interest in them and now like my mom I grow them in my garden. That's a great plant. I would love to have some of those! Certainly reminds me of my early years growing up in northern Ohio where my mother brought them in the house. By spring they were stalks with no living leaves. What a mess.